Make sure that the handles of valves you have turned are now at 90 degrees to the lines or direction of flow. It sounds to me like you have shut both in/out lines to the tank. That is good. There should be another valve that should be opened to allow water to flow from the cold to the hot line. It is normally very close to the 2 that you have closed but may be further down in the plumbing. My bypass line and valve is located below the tank and is actually in the basement directly below the tank. Minimum Clearance over Truck Bed? I find 6" to be enough for a 6.5' bed but like an additional inch for the long bed trucks because of the additional possible tail movements due to the longer bed. Points of interest will take some time to be useful. Very few so far. If you are into or beyond 'fifty something', you may like Laughlin better than Vegas. Not nearly as much traffic or crowds and still plenty of gambling available and decent shows. Yarome, I have been wanting to do the oven as well. How do you know that it has lit and stays lit without getting down to see? I had a very similar experience except that I was able to get a refund. It was a waste of time. I question doing an alignment with bad tires. I was always advised to have the new tires installed and then have the alignment done. This applied to vehicles and trailers and does make sense. If your tires are not worn exactly flat, how can an alignment be done properly and if they are worn even, you wouldn't be needing an alignment!!! Charles, you would really appreciate the turbo braking if you had the duramax with the Allison. The 8.1 doesn't have nearly the engine retarding effect that the duramax has. Help - what to do? If you are in the Phoenix area, there is an rv recycler/wrecker there that has mostly old stuff. A google search should find them. Google Earth is free and can do a lot of the same stuff as far as routes go. I use it to have a look at the next days trip options to get a good idea of the road ahead. I then use the trucks navigation as the guide when we get close to the destination or whenever I am in doubt about the route at any point. In most cases this works well however, a good wifi connection is preferable when using Google Earth as it can use up a lot of data. The maps app on a smart phone also works well. Maybe they would work at removing uv damage, if you polished afterward. Sorry for the misunderstanding Roger. I have 3 505 and 4 207/209 receivers. The 207/209 receivers are 12v and fairly compact so they are well suited to trailers. I use one for the bedroom TV in the trailer. 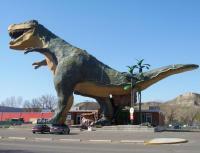 I'm just over in Drumheller if you want to see what I have going sometime. Roger, I guess you don't understand. The new satellite and all the channels on it are not available with any system once you are beyond the border by maybe a hundred miles. The new controller will still tune to the 111 satellite and all channels on the 111 and 107 sats are still available in the south. I get all the channels I get at home so, I am happy!